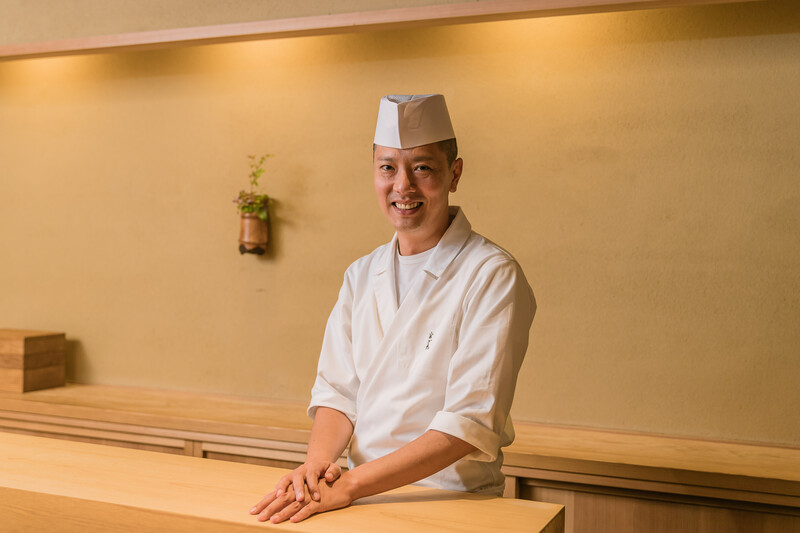 Born in Kanagawa Prefecture in 1975, Mr. Miyazawa got his start back in middle school by helping out at his family’s sushi restaurant. 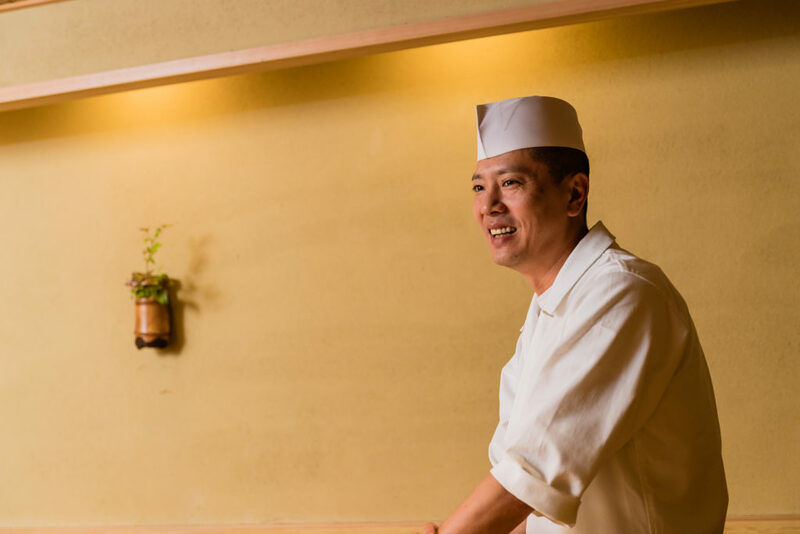 As soon as he graduated from high school he took on work at a local Kanagawa restaurant that served sushi. At age 20 he set out to train in Kyoto, and it was there that he built up his culinary repertoire at noted restaurants like “Irifune” at Kyoto Hotel Okura, as well as “Kakiden” and “Kodaiji Wakuden.” In 2007 he opened up “Jiki Miyazawa,” which was followed by the opening of a 2nd location in 2014 called “Godan Miyazawa.” Mr. Miyazawa was born and raised in Kanagawa, but his attention always lingers on Kyoto. 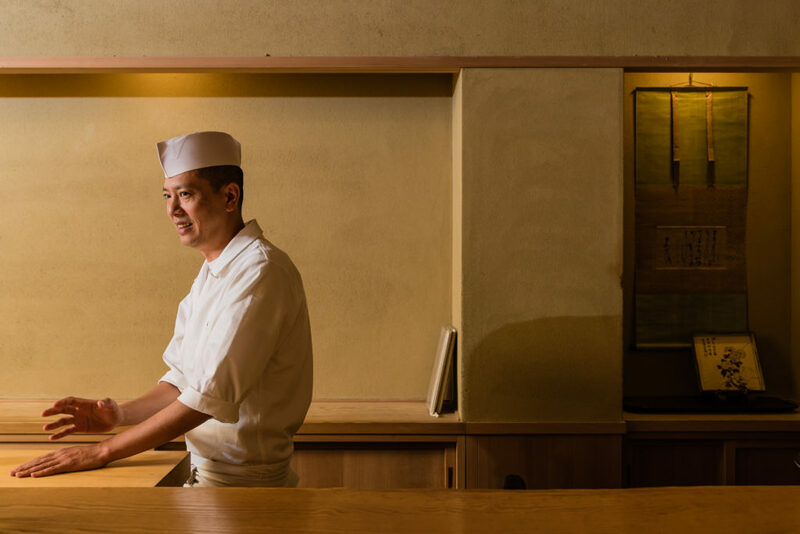 You can see this in the way that his food and menu system revolve around the traditional customs and aesthetics of Japanese tea. 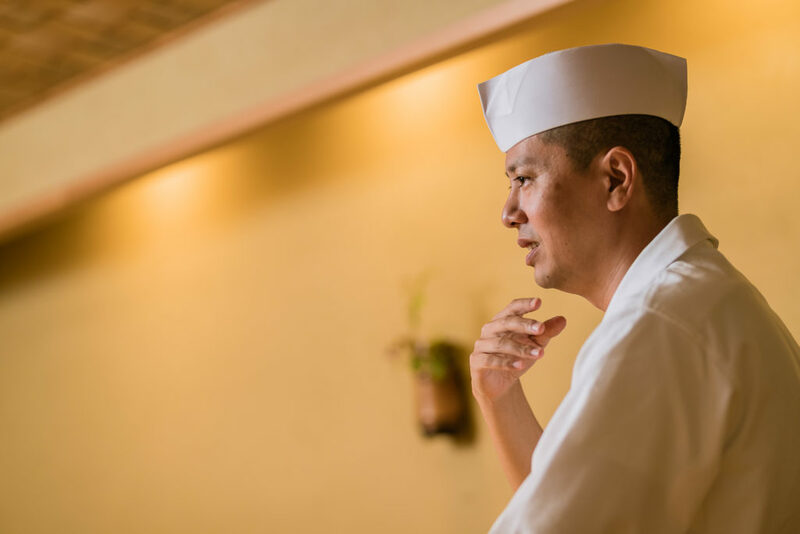 He tells us that rather than manage the staff from above, he prefers to “share each other’s feelings and talk it out in order to grow together.” With that in mind, we talked with Mr. Miyazawa to trace back his career from the beginning and see what led him to where he is today. Let’s start by talking about how you first got interested in working with food. My parents used to run a sushi restaurant, so that’s where things got started for me. I remember writing an essay in elementary school about how I wanted to become a chef someday, which was based on seeing my parents work. So, once I got to middle school I started helping out at their restaurant. After I got involved in that work I started to wonder about whether I could ever actually sit in an office and become an ordinary company man. Naturally this compelled me to buckle down on my career, and when I was in my 3rd year of high school I decided that I should find entry-level work at a restaurant somewhere . Culinary school didn’t come up as an option? I really put my time in helping out at my parents’ restaurant, so going to culinary school wasn’t an option for me. I also think that I didn’t mention anything about it to avoid burdening them. To add to that, once I finished high school I already had a job lined up at a restaurant thanks to my dad’s connections at the wholesale market. I was much more interested in starting my career right away with actual kitchen work. I imagine that your father saw you as the future heir to your family’s restaurant? I don’t think that was the case at first. When I originally told my dad about wanting to pursue a career in cooking I was surprised to hear him say that I should try out the corporate ladder instead and work at a company job. However, in the end he told me that if I’m really serious about cooking then first I should show my resolve by spending like 3 years washing dishes. He tracked down a restaurant for me and I went in there with that frame of mind. What kind of restaurant did you start at? I started at a local sushi restaurant in Kanagawa. It was pretty big and seated about 100 people all together. There were around 10 chefs on staff, and a lot of them had started working full-time after they finished middle school. Quite a few of the more experienced chefs there were actually younger than me. When I first got in there I approached things like my dad said and was ready to scrub dishes for 3 years, but at the same time I had prior experience from helping out at the family restaurant, which meant that I was able take on different roles in the kitchen and make some use out of everything I had learned. I was happy about that, but I also remember having a vague feeling of uncertainty and I wondered about whether this was the right way to do things. Were you able to overcome that feeling of uncertainty? About half a year went by and suddenly a chance opportunity to go to Kyoto popped up. When I got there I saw the neighborhood around Gion and thought, “Wow, look at this place! I have got to be here in Kyoto!” I was thrilled about it, and from then on Kyoto was all that I thought about. I talked to my dad about it since I was hoping to get there as soon as possible and start training. I was worried that he would get angry and come down on me about it, but instead he told me to go for it. The restaurant that I was originally hooked up with let me leave after a year was up, and then from there it was off to Kyoto. Did you have any connections in Kyoto at the time? No, none whatsoever (laughs). In hindsight this was completely reckless of me, but I just went directly to a restaurant in Kyoto and abruptly said, “Please let me work here. I’ll do anything!” I was confident that all I needed was determination. The proprietress that I talked to had some doubts about it, and somehow or another I ended up getting a meeting with the person in charge of the kitchen. But in the end they told me that they had no interest in “unknown slackers like me.” They said that the proper protocol was to get a referral from someone that could make an introduction and vouch for my reliability. They told me that I had to start over and do it right. I made a big commitment and I was really excited when I got to Kyoto, so I was seriously shaken up by that. After that whole ordeal I decided to head back home to Kanagawa for the time being. What did you do when you went back home? After I got back to Kanagawa I got an opportunity to work at a kaiseki restaurant. It was just a small establishment with a proprietor and two others that helped with the food. The proprietor there knew a lot about drinkware for tea and took me around different places to teach me how to appreciate the beauty of “honka” (*1). I hadn’t given up on working in Kyoto, and I would talk about how I wanted to end up working there at some point in the future. I wanted to soak in Kyoto’s atmosphere as much as I could, so I would get on a late-night bus and make excursions into the city every month. Then after about 2 years went by I ran into someone who was kind enough to put in a good word for me over at Kyoto Hotel Okura. That’s when I finally got to train in Kyoto like I had wanted. 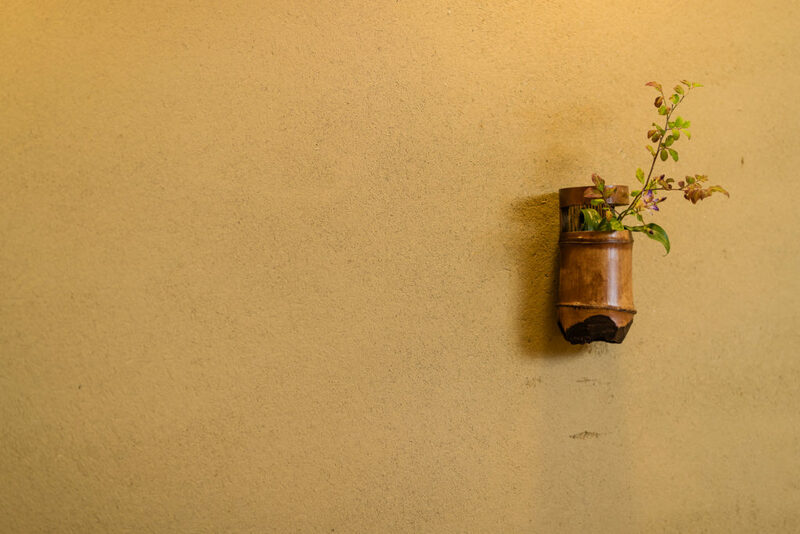 In this case “honka” refers to foundational pieces, such as utensils and bowls, that form the basis of traditional Japanese-style drinkware used for tea. So things finally worked out in the end? When I started at Kyoto Hotel Okura I was surprised to find everyone there studying Japanese tea. My first thought was, “Why are these guys learning about tea like this?” But, you know the food they were making was dependent on things like tea and flowers. In those days I didn’t know anything about the culture behind traditional Japanese cuisine. While I was there I learned about the proper etiquette and arrangements that come into play during traditional tea drinking, but more than that I found a lot of inspiration in the hospitality side of it and the way you have to put your heart into serving guests. I also became very interested in tea utensils and drinkware after that. I wanted to keep digging deeper into tea, and based on that I went on to “Kakiden” to keep training. At Kakiden it was more about studying tea than working as far as I was concerned. In some cases I would take off from work if I had a chance to take tea lessons. I was completely absorbed by it. I use the experiences I picked up there to teach everyone about tea over at my current restaurant. About how old were you during this time? I was about 22 or 23. 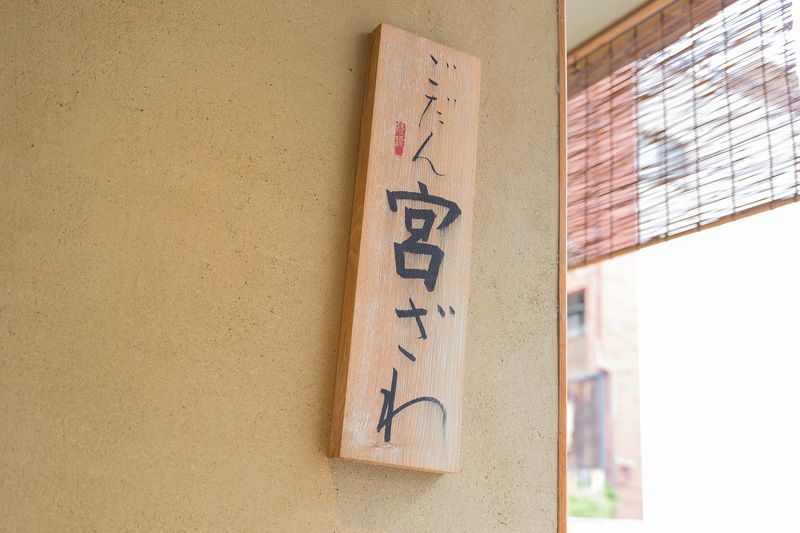 It was always exciting to be at Kakiden, I mean everything that I was interested in was there so I couldn’t help but have fun working at the restaurant every day and getting to learn whatever I wanted. At Kakiden we made kaiseki cuisine to take to formal tea gatherings, and the authentic utensils we handled were the type of things that you only see in museums. I got see and feel “honka” pieces for myself, which was amazing to experience. I knew right then and there that that’s what I was searching for. My own sense of self-confidence sprouted from this. It simply started as wanting to study more about tea utensils and drinkware, but it ended up becoming a real passion for me. I wanted to come in contact with gorgeous, authentic pieces like that. It was like a compulsion. Sounds like you were completely immersed in that world. Was this around when you started thinking about having your own restaurant? When I was 18 and just getting started I had a fuzzy notion of having my own restaurant at 30, but I didn’t have any concrete ideas about how to do that. The ideas started to formulate when I was around 23 years old, which was when I went to eat at a restaurant called “Onjaku” in Nara Prefecture. The determined disposition of the person in charge there really inspired me as well. While I was there I could tell that I had finally found what I was looking for in terms of what kind of restaurant I wanted to have. This was the moment that I started to move forward with plans to open up a restaurant of my own. My ideas started to take shape around this time and propelled me to go create something on my own. Even now I still take each day on with that same type of passion.